Though we originally built GoSoapBox around audience Q&A, real-time polling, and our awesome Confusion Barometer, Quizzes, by far, have been GoSoapBox’s most heavily used feature. 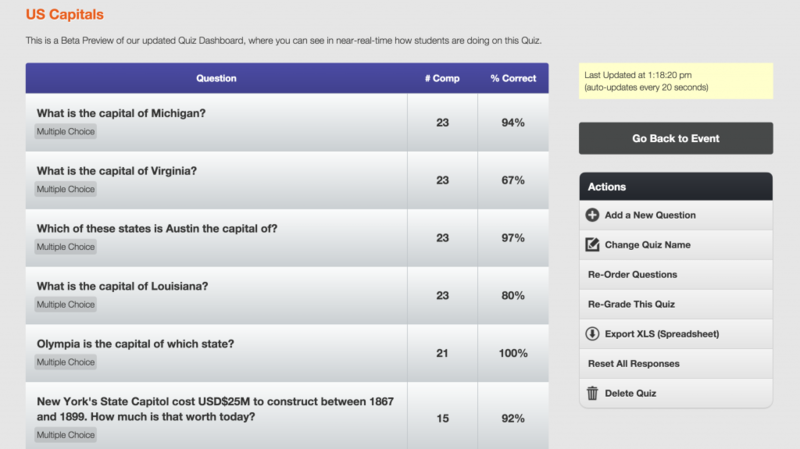 Ironically, Quizzes has also been the feature we’ve given the least attention. Today, we are happy to announce that a new Quiz Dashboard is available to teachers and academics. To access it, make sure you’ve enabled Beta Preview functionality in your Event (accessible via the Moderation Panel), and then click into any Quiz and choose “Beta Quiz Dashboard”. At a glance, you will see how far along in the Quiz students are. And if you’re set correct answers for questions, you can also see how they are doing. It’s hard to imagine anything that could be more convenient for formative assessment. Even better, this view automatically updates every 20 seconds (in the future it may be more frequent). So you can sit back while student responses roll in. As always, you can still download an Excel spreadsheet with all of the graded responses. This new Quiz Dashboard will eventually become the default view when accessing a Quiz, so please give it a try and let us know what you think by emailing support@gosoapbox.com. Our engineering team has also been working hard at improving overall Quiz performance. We had noticed, recently, that GoSoapBox would lag when Quiz functionality was at peak usage. A few things were causing this, but we found and corrected the problems, so Quizzes should now run faster than ever for students. This entry was posted in product updates and tagged quiz, quizzes on March 23, 2015 by Dave Mulder.